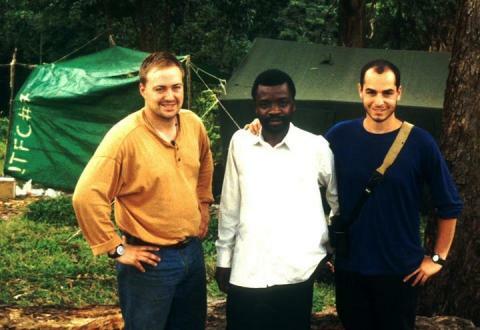 This is a photo of three researchers--Tom Gnoske, Charles Kahindo, and Ben Marks, who all still work for or with the Field Museum--in Bwindi-Impenetrable National Park, Uganda, in 1997. Our current research includes work on the evolution and the conservation of birds, but also on parasites, amphibians and reptiles, and small mammals. These projects are collaborative with the long-term goal of building capacity for biodiversity studies in the countries where we work. Our efforts to sample extensively across regions such as the Albertine Rift and Malawi have resulted in modern data-rich collections for many types of studies including traditional morphologic studies. Genetic work—sequencing and comparing the DNA of related birds—has shed much new light in recent years on the biological diversity of areas like the Africa’s Albertine Rift. It also has revealed much about the evolution of birds in the region highlighting the importance of conserving certain areas, particularly forested highlands such as the eastern Arc Mountains of Tanzania and the Albertine Rift. Genetic data offer a powerful tool to assess diversity of such regions. Environmental niche modeling is another modern tool that we are using to shed light on how birds and other organisms are responding to climate change through time. These analyses also provide opportunities to assess might could happen in the future. Our parasite and pathogen surveys provide essential baseline data (both genetic and morphologic) to assess these agents in birds and small mammals. Such studies have implications for how diseases are transmitted from animals to humans. Click on the links below for details of the Field Museum's ongoing research projects in Africa.